Power supply with built in EMI filter. ELECTUS Distribution has released a new range of compact, light weight industrial DIN rail switch mode power supplies that feature full temperature, voltage and current overload protection. The power supplies have a built-in EMI filter, a power-on LED and operate from 85-264V ac at 47-440Hz. 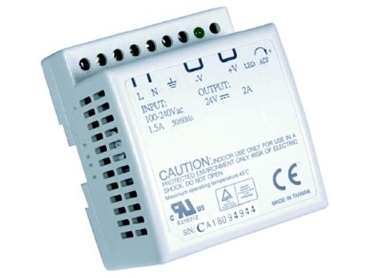 Two models are available with outputs of either 12V dc at 3.5A or 24V dc at 2A. Input and output connections are via a 7.5mm pitch terminal block. Both models have TUV, UL508 and EN60950 safety approvals.